Peterhead's Rory McAllister gets above the Dunfermline defence. A dramatic late winner saw Peterhead leapfrog the Pars and round off a magnificent week for the club. A 4-0 victory at Stranraer was followed by a 5-3 win at Falkirk in the Challenge Cup and all three points in this terse encounter which saw the Blue Toon move into second spot. Late confusion involving a possible suspension for on-loan full back from Dundee, Cammy Kerr, meant he had to sit this one out and with fellow defender Scott Ross suffering from food poisoning and Steve Noble still absent, a far from first choice defence lined up against an in-form Dunfermline. The home side took the game to the Pars and after Shane Sutherland headed a Jamie Stevenson corner over early on, Jordan Brown was denied the opener in the 8th minute by a brave diving block from keeper Sean Murdoch. The deadlock was finally broken after a scrappy opening half hour. Sub Josh Falkingham rashly challenged Nicky Riley on the left side of the penalty box and Rory McAllister calmly scored from the spot for his eighth goal in seven days. The visitors saw plenty of the ball but rarely threatened until just before the break when they were level, Michael Moffat heading in at the back post from a left wing cross by Joe Cardle. If the Blue Toon had dominated the first half, it was Dunfermline who almost complete had the upper hand in the second period laying siege to the home goal for long spells. Graeme Smith was magnificent and kept the Pars at bay virtually on his own. The ever dangerous Faissell El Bahktoui dribbled the ball across the penalty area before unleashing an angled shot that Smith pushed clear. Moffat had an overhead kick saved then sub Ryan Wallace thundered a 25-yard rocket that looked to be going in under the crossbar until Smith turned the ball away for a corner kick. Peterhead were hanging on and would have taken a point for sure, then with a minute to go, a rare moment of relief for the under pressure Peterhead rear guard saw them score the winner. The ball fell to sub Leighton McIntosh on the right side of the penalty area and he dinked it past the stranded Murdoch and into the net for a late winner as a reward for bravely hanging on and forcing their tired limbs to still go in search of another two points. Peterhead: Smith, Blockley (Ferries 61), Redman, Brown, Gilchrist, Strachan, Stevenson (McIntosh 19), Dzierzawski, McAllister, Sutherland (Rodgers 64), Riley. Subs (unused): Jarvie, Adams, Lawrence, Baptie. 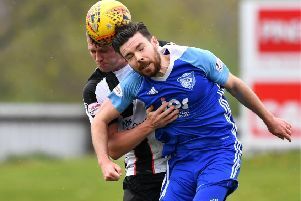 Rory McAllister outshone the second coming of Lee Miller as Peterhead knocked last year’s Scottish Cup finalists out of the Petrofac Cup. McAllister scored all five of his side’s goals in a sensational rout that looked highly unlikely early on. But the Blue Toon were clinical in their sensational show and delighted their noisy band of followers – just about the only spectators left in the Stadium come full-time. Yet the Bairns had started brightly and were handed a penalty to start when Ally Glichrist punched the ball in the box. But Graeme Smith was the Blue Toon hero by beating away the spot-kick. His opposite number, perennial Bairns sub Graham Bowman, had a completely different night. The Bairns continued to plough forward after the miss and scored a lovely opener when Blair Alston’s driving run fed in to David Smith. The ball sat up nicely for him after his first touch and he floated a high shot over Smith and into the net. More was to follow from Falkirk as Watson headed in the second, though McHugh standing in the goalkeeper’s path at the corner-kick also claimed a touch. He could have certainly had his goal when Smith broke into the box and cut-back but the former Motherwell man blazed over. Then Peterhead scored. It was contested by the Bairns who not only felt it was offside - a claim proven to be true by Falkirk TV cameras at the interval - but also that McAllister had controlled the ball with his hand before lobbing Graham Bowman in goals. The sub-turned starter had an awful first half and was rooted to his goal-line when Jordan Brown skimmed a pass across the six-yard line and McAllister tapped in a second. The Bairns were rocked and failed to recover by the time McAllister had sealed his hat-trick. The defence was in disarray as McAllister twisted and turned in the box. Shooting at Bowman but reclaiming the rebound and tucking it in through a cluster of bodies on the goal-line frantically trying to keep the scores level. The Bairns ears must have been ringing from a half-time dressing down, as well as the chorus of boo’s that met the half-time whistle, and emerged and immediately tested Graeme Smith with a drive from his namesake Davis which was pushed just outside of the upright. Throughout all the defensive frailties Lee Miller looked a classy presence up front and just the frontman Falkirk have been seeking for several seasons. The Bairns huffed and puffed and finally got level through Alex Cooper’s header seconds after he’d come on as a substitute. On a night for goalkeeping howlers Graeme Smith let the ball slip through his arms and the Bairns were level. The errors weren’t over yet though and McAllister restored the Blue Toon’s lead with a thunderbolt from around 35 yards after a punt from Smith. It was route one football at it’s best and caught Bowman unsighted again. But there was no let-up for the young keeper as Will Vaulks was booked at a corner in injury time and McAllister stroked the spot-kick in for his fifth.